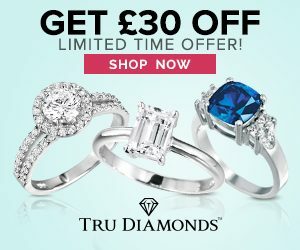 Tru-Diamonds Voucher for 2018 - £10 Off All Orders! Due to a very successful year on AWIN in 2017, we've decided to start this year with a bang by providing a £10 Voucher to all publishers for the whole year! This offer is a classic must-have that a lot of your customers would love to use, especially if they can get that extra discount on our already discounted items! Even better, this offer code can remain on your sites until 31 December 2018! Allowing customers to make proper use of this code and driving sales and commission! Improve your commissions with this limited time offer, all you need to do is promote, promote, promote! Valentine's Offers from £69 & Free Gifts! 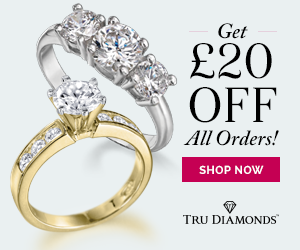 Now your customers can save up to £200 on selected items from our Valentine's Day promotion! What's more is that they will also receive a Jewellery Cleaning Spray with their orders, and a Heart Shaped Jewellery Box with Orders over £200, absolutely FREE! Use Offer Code AF1802 at checkout to get these discounts and free gifts! 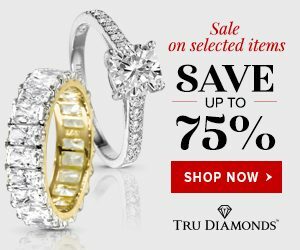 Allow your customers to take their time to choose the items that grab their attention from our exciting Valentine's collection and treat themselves - or someone special - to the look, luxury and prestige of fine quality diamonds at a mere fraction of the price with environmentally friendly, ethically created Tru-Diamonds™. Wishing you and your customers a Valentine's Day filled with love and happiness. 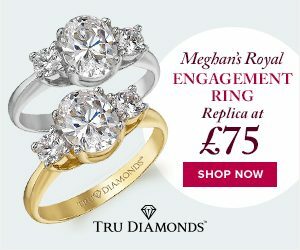 Meghan's Royal Engagement Ring - Replica for £75! 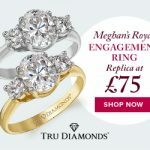 Meghan's Royal Engagement Ring Replica for £75! In celebration of the royal engagement between Prince Harry and Meghan, we are providing our replica of Meghan's Royal Engagement Ring for only £75! Limited Edition Replica is set with genuine Tru-Diamonds! When Prince Harry proposed to Meghan Markle he bestowed her with a beautiful ring featuring a 2.5 ct. cushion cut centre stone which he sourced from Botswana, where they had enjoyed their first vacation together. He flanked this stunning gem with two round diamonds taken from a brooch that belonged to his mother, the late Princess Diana. Now, we're proud to bring you our limited edition replica of this priceless piece, set with genuine Tru-Diamonds gems at the special, low Introductory Price of Only £75. 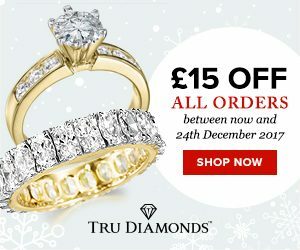 Xmas Vouchers from Tru-Diamonds are making this Christmas even more festive available till 2018! 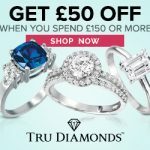 We are making our luxurious jewellery even more affordable with these discount offers which will contribute to a massive boost in your sales! With everyone focused on buying Christmas gifts, these vouchers will prove their appeal by helping customers save that little bit extra this year. 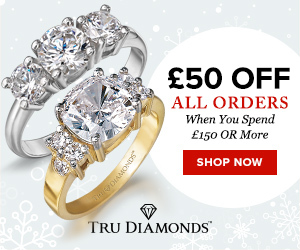 Now your customers can save £15 or £20 on all orders, OR £50 on orders over £150! Please see the three different categories and details of each offer below. Offer valid for a limited time only! Improve your commissions with this limited time offer, all you need to do is promote, promote, promote! 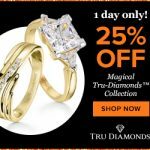 Magical Collection - 25% Off PLUS a FREE Gift with YOUR ORDER! 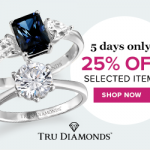 Magical Collection - 25% Off Our Tru-Diamonds™ Magical Jewellery! Our Magical Collection provides all women with the opportunity to add that Magical Tru-Sparkle to their wardrobe. 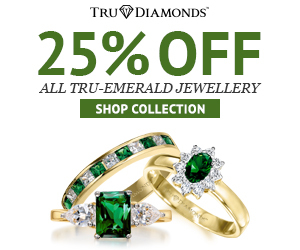 Get a 25% discount on all Selected Items including a Free Gift with your order. This offer can only be claimed when entering offer code AFH17 at checkout and is only valid until the end of this week. Pretty in Pink - 30% OFF! 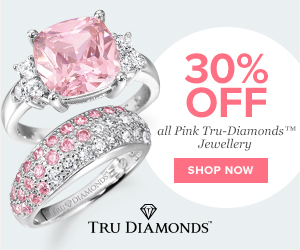 Pretty in Pink Tru-Diamonds™ Collection - 30% Off All Pink Tru-Diamonds™ Jewellery! 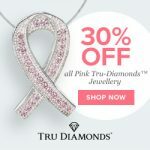 Our Pretty in Pink Collection provides all women with the opportunity to adorn themselves in Pink Tru-Diamonds Jewellery during the month of October. This Offer has been created in order to commemorate the strength of all women that had to fight against Breast Cancer in the past as well as the present. Get a 30% discount on all Pink Items including a Free Gift with your order. This offer can only be claimed when entering offer code AFBC17 at checkout and is only valid for the month of October. 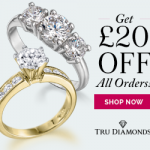 £20 Off All Tru-Diamonds™ Orders! 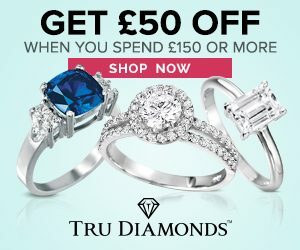 Tru-Diamonds™ has been inspired by the Emmy Awards to provide a £20 Discount on all our jewellery orders! Because we believe everyone should look and feel like a celebrity. Especially relevant is that this limited time offer can be applied to our already fabulous discounted items on our website. Thus, customers can receive this additional discount on web orders only! So does "VIP" really stand for "Very Important Person"? More like "Very Important Purchase"! 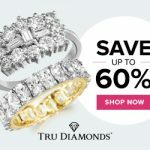 Summer Holidays Collection - 60% OFF Tru Diamonds! We are offering our exciting Summer Holiday Specials to your customers where they can SAVE up to 60% on selected items! 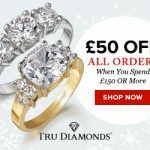 First of all, Summer holidays are imminent, whether your customers will be enjoying the countryside, the seaside, cruise or at home entertaining friends... they can show off their jewellery and receive admiring compliments for only £69! While your customers are trying to make a style statement or invest in something a little bit more refined, our collection offers something for everyone. 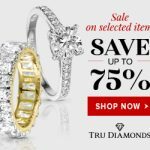 Furthermore, Tru-Diamonds™ would like to remind all our publishers that our Offer Codes AF1707 and AFW17 have expired. Please remove these offer codes and any mentions of our 40% Off Bracelet and Summer Sale from all sites with immediate effect. Help your customers enjoy their summer holidays with these stunning summer sensations! All you have to do is to promote this amazing offer! WIMBLEDON VIP OFFER - 40% OFF All Bracelets! To coincide with Wimbledon w are giving your customers a 40% discount on all bracelets and bangles! What does tennis have to do with a diamond bracelet? Believe it or not, it all stems back to an incident in 1987 when tennis champion Chris Evert was wearing a bracelet whose clasp broke in the middle of a televised match. The game was stopped to allow her time to find her pretty diamond accessory and so the name "Tennis Bracelet" was born. 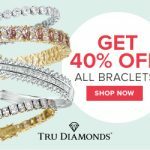 Now your customers can get their own Tennis Bracelets at a 40% discount to wear at Wimbledon this year. Please note that the URL below should include the variable - /Bracelets.htm?media=AFW17 – for the discount to apply. The Offer is only available for a Limited Time Only! 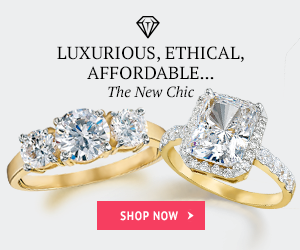 We hope your customers find many enticing pieces to fall in love with. SUMMER SALE - Up to 75% OFF! 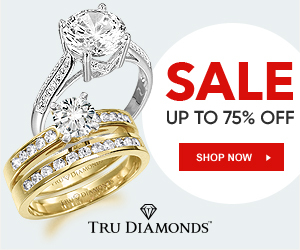 Now your customers can add some of our most popular pieces to their jewellery collections at massive discounts of up to 75% below our already low regular selling prices! This will help to ensure your commissions are maximized during the Summer Holidays. We hope your customers find many enticing pieces to fall in love with from this Super Summer Sale. Please note that the URL below should include the variable - /ON-SALE.htm?media=AF1707 – for the discount to apply. The Offer is only available for a Limited Time Only! 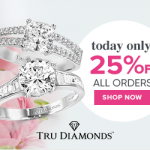 Now your customers can enjoy the status, pleasure, and confidence of top grade diamond jewellery at a fraction of the price with Tru-Diamonds™. 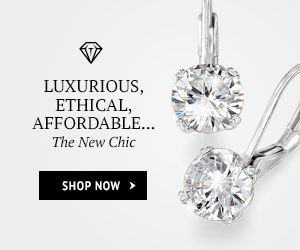 Our top quality precision-cut simulated diamonds that are admired by all, including experts! Enjoy your Summer by increasing your commission with this Super Sale! 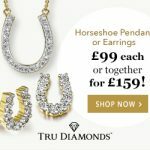 Tru Diamonds - AWIN Offer - Horse Shoe Jewellery Set at £159 OR £99 Each! Horse Shoe Pendant and Earrings Set for only £159 OR at £99 each! Horse Shoe Pendant and Earrings Set now only £159! In celebration of the upcoming Royal Ascots, we are providing this lovely Horse Shoe Pendant and Earrings Set for only £159 OR at £99 each! This stunning VIP offer includes a FREE gift with all orders so your customers can keep their jewellery clean and sparkly. This VIP offer is only available from the destination URL below and expires on Monday 26 June 2017. 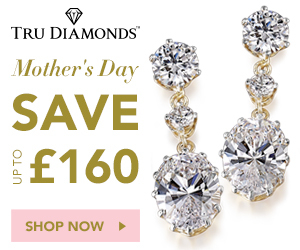 This offer gives your customers the opportunity to wear a stunning Horse Shoe Jewellery set that will be the perfect accessory with their cocktail dress and summer hat at the Royal Ascots this year. 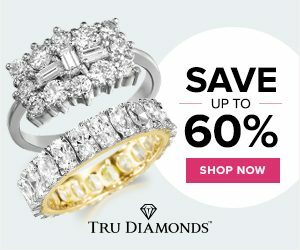 With Tru-Diamonds your customers can enjoy the status, allure and confidence of the world's most expensive designer diamond jewellery, without the enormous cost. Especially when one would like to make a stunning impression at an event such as the Royal Ascots! 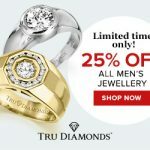 25% Discount on Men's Jewellery Range! 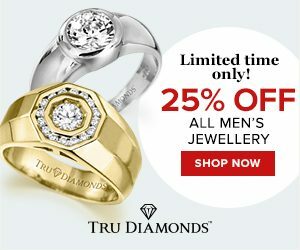 25% Discount on our Men's Jewellery Range! Since Father's Day is around the corner, we will provide you with an exciting 25% Discount on our Men's Jewellery Range! Our superb men's item range will make your customers look good and feel confident in any situation. Especially with that expensive suit for that formal occasion, business function, and most of all when asking the question to which she'll say "yes". 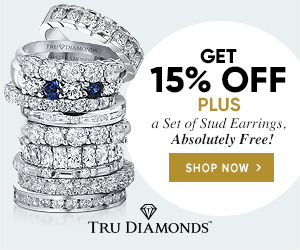 Allow your customers to spoil themselves, their fathers, their grandfathers, or the fathers of their children with these superb Tru-Diamonds pieces. 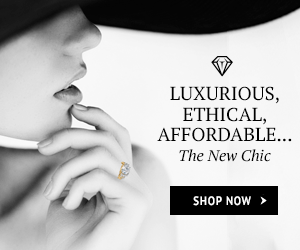 After all, our jewellery makes for the perfect gifts to give or own. This VIP offer can only be claimed with offer code AFFD7 at checkout and as a result, cannot be used in conjunction with any other offer. In conclusion, this offer expires on Monday the 19th of June. Tru-Diamonds™ has been inspired by the Cannes Film Festival to provide a £20 Discount on all our jewellery orders! Because we believe everyone should look and feel like a celebrity. Especially relevant is that this limited time offer can be applied to our already fabulous discounted items on our website. Hurry! Most noteworthy is that this offer strictly expires on Monday 5 June at Midnight! Therefore, improve your commissions with this limited time offer, all you need to do is promote, promote, promote! 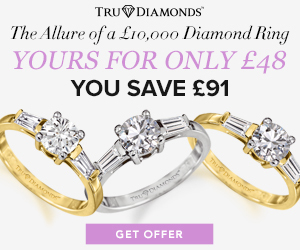 In conclusion, this is a win-win opportunity for both you and your customers, as they will gain a stunning simulated diamond jewellery piece. Whereas you will gain from strong commissions on your sales! 25% Off our Chelsea Flower Show Collection! 25% OFF our Chelsea Flower Show Collection! In celebration of the annual Chelsea Flower Show in London, we are providing a 25% discount on some of our most popular colour stone items as well as floral jewellery items. This is a VIP offer as customers can only get this discount on the items listed on this specific landing page, which is not available to anyone on our website! This offer is also valid for 5 days only! AFCFS7 is the offer code needed to claim the discount at checkout and expires on Monday 29 May 2017. 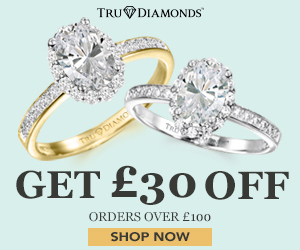 Get £30 off all orders up to £150 OR £50 off all orders over £150! This exciting offer has been very successful in the past, and will now be available on Affiliate Windows for the first time ever! This is just one of our many testimonials from our customers. Therefore, in celebration of our positive customer feedback, we are providing our current customers with this great voucher! This limited time offer can be applied to our already discounted items on our website. Offer strictly expires on Monday 22 May 2017. Improve your commissions with this limited time offer, all you need to do is promote, promote, promote! 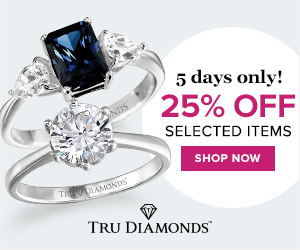 SAVE 50% on selected items in our Tru-Diamonds™ Trilogy Collection! 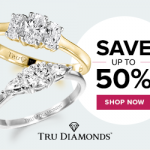 SAVE up to 50% on our Tru Diamonds Trilogy Jewellery Collection that features flawless pure white Tru-Diamonds™ gems! This collection includes the replica of Kate's ring that used to belong to the late Diana, Princess of Wales. We hope your customers find many enticing pieces from this Collection to give or receive from their loved ones as an eternal reminder of their journeys past, present and the ones yet to come in future. This campaign has proven exceptionally successful with regards to income and has a very good response rate in Mail Order, and we know it will help you make sales to improve your commissions. We help by providing you with these amazing offers, all you need to do is promote them! 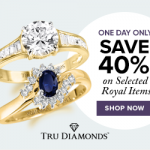 Tru-Diamonds - 40% OFF ROYAL ITEMS! 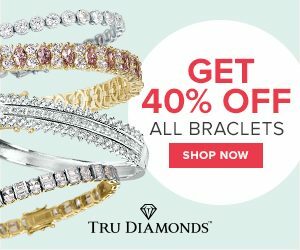 Tru-Diamonds™ - 40% Off our Royal Jewellery Selection! Get 40% Off selected Royal Items in celebration of the Queen's birthday, for one day only! Allow your customers to adorn themselves in beautiful simulated emeralds, rubies, and sapphires. Best of all is that these items are some of our top sellers! 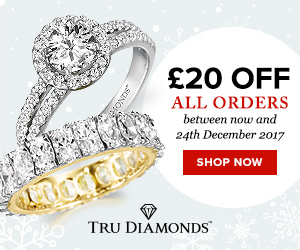 Even the replicas of the Queen's Coronation Jewellery are included in this offer. 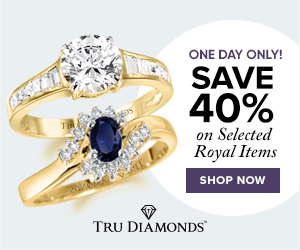 So why not take advantage of this amazing offer to get more sales where your customers can get 40% Off our Royal Items? This can only be claimed with offer code AFQB7 at checkout on our website and expires on Saturday 22 April 2017. Please note that this offer cannot be used in conjunction with any other offer. This offer strictly expires on Saturday 22 April. Improve your commissions with this limited time offer, all you need to do is promote, promote, promote! We hope you receive a great response with this offer! A win-win situation for everyone!